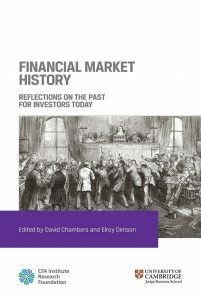 A recent project funded by the CFA Institute Research Foundation was the writing and publication of Financial Market History: Reflections on the Past for Investors Today. Financial Times senior investment commentator John Authers praised this collection of essays as “a great new compendium on financial history“. The free eBook can be downloaded here. Additionally a series of recent interviews with the authors and co-editors can be viewed here.